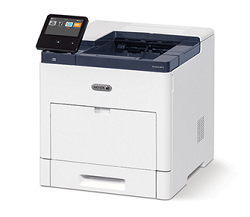 The Xerox VersaLink B610 is a black and white printer with a single function for printing, the B610 does not support scans, email, copy, or fax functions so this printer is not suitable as a commercial printing machine. Supported with cloud connectivity and smart features make it easier to use. VersaLink B610 is a small compact desktop device with no large physical buttons because all operations are centred around a 5-inch touchscreen, which is a ConnectKey technology center. This technology acts as a smart workplace assistant and allows users to touch, pinch, and scroll instead of having to wade through a confusing sub-menu system. ConnectKey supports printing from smartphones, plus a number of other features such as cloud operation. The B610 has an Ethernet, USB 3.0, and NFC connection as standard, with the option of adding Wi-Fi and Wi-Fi Direct. This printer has a standard capacity paper tray that can hold 700 sheets, you can use an additional tray of 2000 sheets to optimize your printing. Download the Xerox VersaLink B610 driver according to the Operating System on your PC or laptop at the link below.